CLOSEOUTS. Salomonand#39;s Ellipse Winter hiking boots are light-yet-sturdy hikers well-suited to wet, wintry environments. 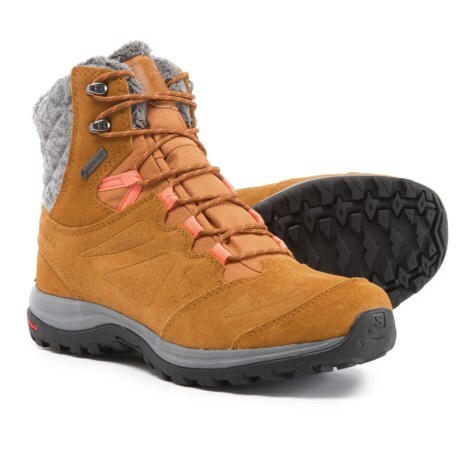 Gore-Texand#174; Insulated Comfort technology, tough suede construction, a cozy faux-fur lining and a grippy lugged rubber outsole ensure warm feet and stability in snowy terrain. Available Colors: RAWHIDE LEATHER/RAWHIDE LEATHER/LIVING CORAL. Sizes: 5, 5.5, 6, 6.5, 7, 7.5, 8, 8.5, 9, 9.5, 10.